While Domaine des Chanssaud can be dated all the way back to its humble, Southern Rhone Valley beginnings in 1826. The domaine is located in Orange, not far from the village of Chateauneuf du Pape. However the modern era for the property begins more than a century and a half later in 1986. That is the year the young, Patrick Jaume took over managing the estate. It was under the direction of Patrick Jaume that began to produce, bottle and sell their own wine. Prior to that date, the harvest was sold to negociants. If the Jaume family name sound familiar to you, it should. Patrick Jaume is the brother of Alain Jaume, the owner of Domaine Grand Veneur. The two vineyards are located quite close to each other, as you might imagine. Domaine des Chanssaud owns 20 hectares of vines in the Chateauneuf du Pape appellation. 17.5 hectares are used for the growing of red wine grapes. 2.5 hectares of their vineyard are reserved for white wine, grape varieties. Their best vineyard parcels are located in the northern part of the appellation with its cooler microclimate. The terroir has a mix of rocks, stones and clay soils. Their vineyards are dispersed in Chateauneuf du Pape, but they definitely have vines in the Boislauzon, Cabrieres and Chapouin lieux-dits. Their oldest Grenache vines are close to 120 years of age, making them some of the oldest vines in the appellation. Domaine des Chanssaud makes 2 red Chateauneuf du Pape wines and 1 white Chateauneuf du Pape wine. Domaine des Chanssaud Chateauneuf du Pape is made from a blend of 86% Grenache, 8% Syrah, 5% Mourvedre and 1% Cinsault. The grapes are 100% destemmed. Vinification takes place in old, traditional concrete vats. The wine is aged in a combination of foudres, concrete vats or used, French oak barrels for 12 months before bottling. The average annual production is 2,400 cases per year. Domaine des Chanssaud Chanssaud d’Antan is produced from 90% old vine 90% Grenache that is on average 85 years of age with 5% Syrah and 5% Mourvedre. The wine is aged old foudres for about 12 months prior to bottling. The average annual production is 500 cases per vintage. Domaine des Chanssaud Chateauneuf du Pape Blanc comes from a blend of 70% Clairette and 30% Grenache Blanc. Close to 800 cases are made each year. Domaine des Chanssaud can be enjoyed on the young side. Young vintages can be popped and poured, or decanted for about 1 hour, give or take. This allows the wine to soften and open its perfume. Older vintages might need very little decanting, just enough to remove the sediment. Domaine des Chanssaud is usually better with 2-4 years of bottle age. Of course that can vary slightly, depending on the vintage. In the best vintages the wine should be consumed within 3-12 years after the vintage. Domaine des Chanssaud is best served at 15.5 degrees Celsius, 60 degrees Fahrenheit. The cool, almost cellar temperature gives the wine more freshness and lift. Domaine des Chanssaud is best served with all types of classic meat dishes, veal, pork, beef, lamb, duck, game, roast chicken, roasted, braised, stewed dishes, sausage, barbecue and cassoulet. Domaine des Chanssaud is also good with Asian dishes, hearty fish courses like tuna, mushrooms pasta, eggplant, tomatoes and cheese. 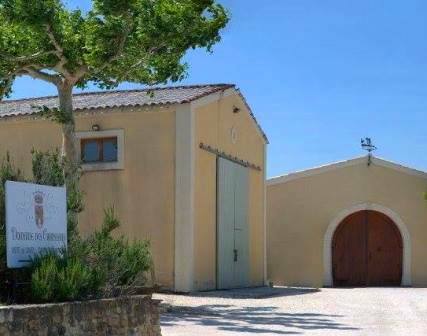 Domaine des Chanssaud also produces red and white wine from 30 hectares of vines they own in the Cotes du Rhone appellation and in Cotes du Rhone Villages. Medium bodied, elegant, soft, sweet and polished, the bright red berries are fresh, mildly spicy and finish with a tinge of green olive and herbs. This should drink well in its youth. Early drinking, ripe, polished, round styled wine with ripe dark red fruits and a plushly textured finish. Medium bodied, soft, brisk red fruits, and a fresh, spicy, kirsch, olive tapenande and peppery finish. Garrigue, spicy cherries, spicy, light, effervescent finish. Medium bodied, fresh and spicy, with sweet, kirsch and soft, juicy dark plums that is ready to go. Ready to go, with its supple textures, ripe, sweet, fresh, dark red fruits, thyme, garrigue and earthy personality that's already on display. Ready to go, this full bodied, round wine is loaded with ripe cherries, black pepper and garrigue. Forward in style, this is already quite tasty.